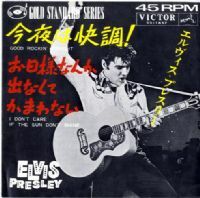 Japan Victor Single With Fold Out Picture Sleeve (SS 1657) - Probably the most sought after of all the Gold Standards with great pic. from Loving You . top condition item - sleeve is Excellent and the vinyl Perfect.